At first glance it looks like something you would only find at a public playground. 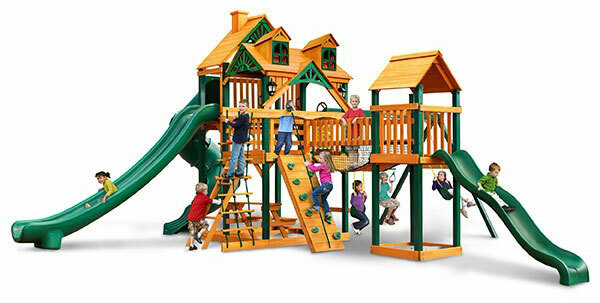 But this incredible, sprawling play set is actually designed for your backyard. 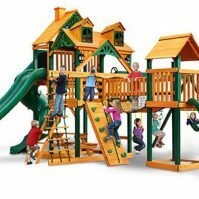 That’s right, the Gorilla Playsets Treasure Trove Swing Set is a residential, wooden play set that brings the playground to you. 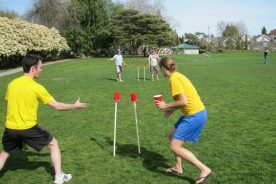 With over a dozen play things to choose from, the Treasure Trove will make your backyard the envy of the neighborhood. 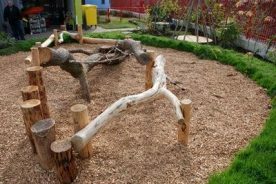 Whether they are active or imaginative your kids won’t know where to start playing. One of your biggest struggles will become trying to convince them to come back inside at the end of the day. 1 So what makes the Gorilla Playsets Treasure Trove Swing Set one of the best swing sets you can buy? 2 What accessories are included with the Treasure Trove Swing Set models? 3 Will I have room in my backyard for a Treasure Trove Swing Set? 4 Is there a limit to the number and size of children that can play on this swing set? 5 What do I need to assemble the Gorilla Playsets Treasure Trove? 6 What if a piece of my Gorilla Playsets TT is missing or damaged? 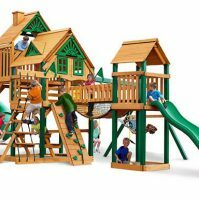 So what makes the Gorilla Playsets Treasure Trove Swing Set one of the best swing sets you can buy? This swing set has almost everything you could possibly pack into one play system. 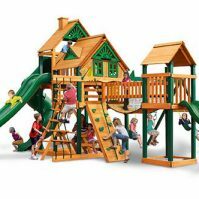 Its most noticeable feature is that it is built around two play towers. The larger tower has two levels that make up its play platform. The first level is 5’ high and measures 4’ x 6’. The second level is easily accessible by climbing a couple of steps and is 7’ high, measuring 2.5’ x 6’. The bonus tower is also 5’ high and dimensions are 3’ x 3’. Both of the towers are covered and have matching roof types either in wood, green vinyl, or Sunbrella fabric. 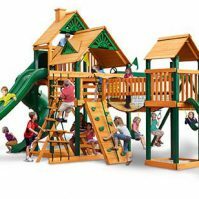 Another aspect of this swing set that makes it a better choice than most of its counterparts is that it has several varying model options to choose from. By simply adding a slide or changing the roof line, the manufacturers are able to offer you 6 different variations of one popular swing set. These 6 models include the Treasure Trove, Treasure Trove II, Treasure Trove Treehouse, Treasure Trove II Treehouse, Malibu Treasure Trove, and Malibu Treasure Trove II. 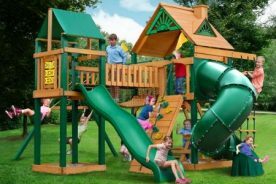 Like any playset from Gorilla, you can be assured that this model will be constructed of solid, cedar wood that is durable and sturdy. Each varying model of the Treasure Trove also comes with the option of their patented Timber Shield coated beams which helps protect the wood of all of the main beams from weathering and cracking. All of the main beams are pre-drilled and all of the needed wood components are pre-cut, pre-sanded and pre-stained for your convenience. What accessories are included with the Treasure Trove Swing Set models? Each of the models in the Treasure Trove line are filled with all of the best accessories that Gorilla playsets have to offer. Each model has the same basic accessories with just slight variations in their roof options and included slides. These differences will be described in the following paragraphs along with being compared side-by-side in the chart below. Option to choose between a green vinyl canopy roof, Sunbrella fabric roof in forest green or Weston ginger, or a wood roof. Will I have room in my backyard for a Treasure Trove Swing Set? Since it is one of the larger wooden swing sets you can buy, the Treasure Trove Swing Set is definitely not for everyone. It does require plenty of space itself so a large backyard is the best location. In addition, it is recommended that you leave 6 feet of clearance on all sides for safety purposes. While some swing sets allow for some rearranging of their configurations to fit a backyard more conveniently, this swing set does not allow much space for reconfiguring. This is due to nearly every surface and opening having a fun accessory already attached to it. Is there a limit to the number and size of children that can play on this swing set? Like most swing set models, the Treasure Trove line of swing sets is built to be sturdy and durable. It is also built with your kids’ safety being a top priority. While all of the wood, metal, and plastic components are high quality, they do have their limits and should be used properly in order to avoid unnecessary injuries or damage. Misuse of the swing set and its parts can also void the warranty should damages occur during use. 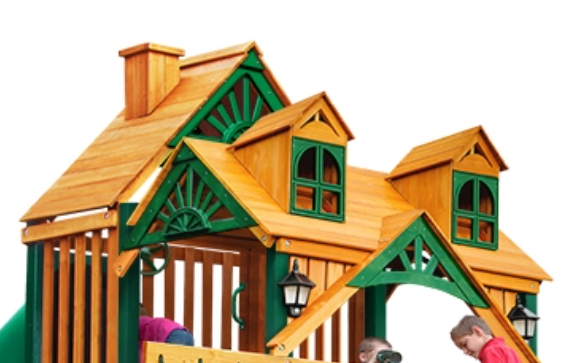 The recommended age range for each of the swing sets is 3 – 11. While there is no specific limit on the number of children that can be on the swing set, each fort platform can hold a total weight of 800 lbs. That’s quite a few little 3 or 4 year olds! All of the slides and the rock wall have a weight limit of 150 lbs. The rope ladder will hold 75 lbs. Each swing belt is rated at 225 lbs., however the recommended weight on the swing beam for each position is only 150 lbs. The trapeze swing and its swing position will hold 125 lbs. 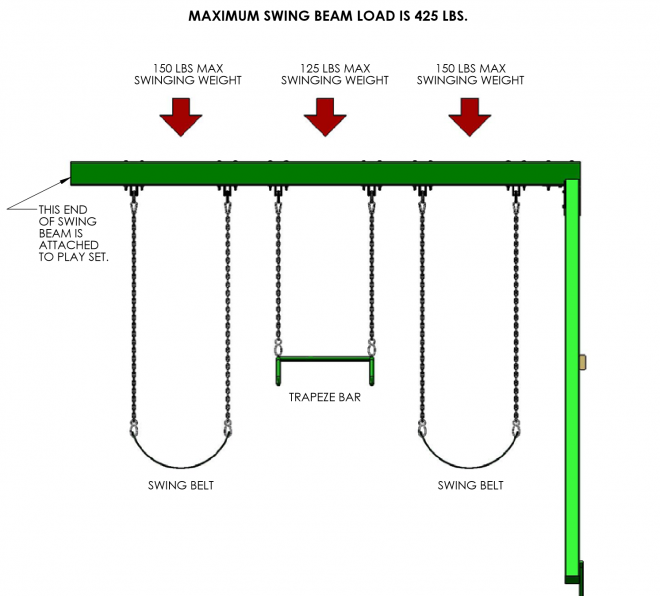 If three people are swinging on the swing beam at the same time, the maximum swing beam load is 425 lbs. If you replace any of your accessories or swings with other components, you can find their weight limits outlined in the included instruction manual. What do I need to assemble the Gorilla Playsets Treasure Trove? Before beginning to assemble any of the discussed Treasure Trove models, or any Gorilla play set for that matter, it is recommended that you take an inventory of everything that is included in the boxes. There is a detailed list of all of the parts, including everything from the largest piece of the lumber to the tiniest screw and washer, at the beginning of the included instruction manual. Taking an inventory of each piece may sound like an extremely daunting task, especially in a manual that is over 150 pages long. However, it is recommended so that you can discover any missing pieces before construction begins. It can be very frustrating to get a play set half way up only to find you’re missing a key component and have to delay construction while waiting for a replacement part. Once you have prepared a space for you swing set, leveled the ground and inventoried all of your pieces, you are ready to begin construction. The instruction manual is designed to be very user friendly and includes a detailed description and labeled diagrams of each step. Lumber is all pre-drilled and labeled so you can easily identify which piece you’ll need to complete each process. While all of the required hardware is included with your swing set purchase, including the small, square-tipped drive bit for the screws, you will need some tools to complete assembly on your own. 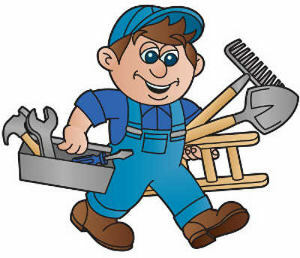 Most of these tools are common things found in the garages and work benches of anyone who does some handy work, but they can also easily be found at a local hardware store, or from the neighbor down the street. What if a piece of my Gorilla Playsets TT is missing or damaged? Most deliveries are made without any problems, unfortunately sometimes large shipments undergo lots of moving and sustain occasional damages. Upon receiving the shipment of your Gorilla playset you will want to make sure you inspect and note any noticeable damage to the boxes or slides. It is recommended that you not refuse the shipment as this could result in additional charges. Once you have inventoried any missing or damaged parts you will need to contact the manufacturer directly to receive replacement parts. If you bought your set from a 3rd party retailer, they can help you contact the manufacturer but will not be able to provide the parts you need. For missing or damaged parts in your Gorilla Playsets TT you can request replacement parts from Gorilla’s “Quick Response Center at www.gorillaplaysets.com/support or call them at 1-800-882-0272. 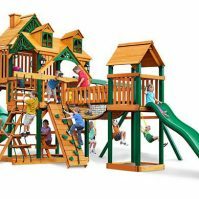 Now that you have decided that the Gorilla Treasure Trove (or one of its variations) is definitely the playset your kids need and verified that it will fit in your yard, the next step is get out the credit card and make a purchase. With a price tag that starts at $3,499 and goes as high as $4,399 for some models it is probably a purchase that you’ll only want to make once and know exactly what you’re getting. You can be assured that with a Gorilla playset you’ll be getting a high-quality play system that will last for years to come. Your kids will love everything it has to offer and you will love that fact that it is safe, durable, and made to last. Whether you have more questions or are ready to order, all of these Treasure Trove models can be found at www.totallyswingsets.com. Ordering online is easy or you can contact their customer service department 7 days a week from 7 AM- 10 PM. They can be reached by phone at 1-800-866-3077 or email at customerservice@totallyswingsets.com. Is a Vinyl Playset Right for Me?